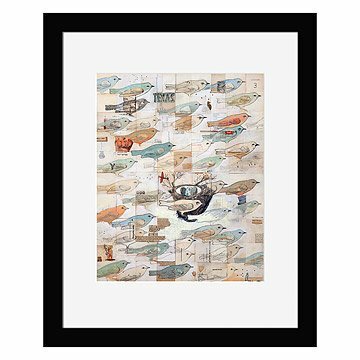 This alluring avian print was created by mixed-media artist Dolan Geiman. Light as a feather and flying through the air, birds remind uf of levity and freedom. Bring that spirit into your nest with this alluring work of avian art by mixed-media artist Dolan Geiman. Using a combination of silk-screen printing and reappropriated materials, Geiman creates works of art that echo elements of American folk art in their tactile beauty. High-quality giclée print of original work signed individually by the artist. Made in Chicago, Illinois. Dolan Geiman is a nationally recognized mixed media artist known for his Contemporary Art with a Southern Accent. Born and raised in the Shenandoah Valley of Virginia, Dolan Geiman’s formative years were defined by outdoor adventures in his bucolic surroundings. Twenty-plus years later, the flora and fauna, found curiosities, and fading Appalachian culture still define Geiman’s contemporary-folk creations. Trained in printmaking and sculpture, Geiman’s mediums span painting, collage, silk screen, drawing, and 3-D assemblage. An advocate for green design and sustainable business, Geiman and his wife Ali Marie currently work from a green warehouse in Chicago’s Bridgeport neighborhood. Framed in Oregon, also available unframed mounted on white acid-free paper matboard.